WASHINGTON — Following months of anti-Shia vitriol in Malaysia, news sources have confirmed that dozens of Malaysians, including young children, have been recruited by ISIS as suicide bombers. According to Malaysian newspaper The Star, “Ahmad Tarmimi has the dubious honour of being Malaysia’s first suicide bomber linked to the Islamic State of Iraq and Sham.” Tarmimi conducted a suicide attack last month that resulted in the deaths of more than two dozen Iraqi military members. “Authorities believe ISIL prefers the younger ones to become suicide bombers as soldiers would be less suspicious of children. Most ISIL recruits are aged between 12 and 18,” a source told the Star. “His exploits were published in the ISIL official website with the title, ‘Mujahidin Malaysia Syahid Dalam Operasi Martyrdom’ with his photograph also featured,” said the Star. 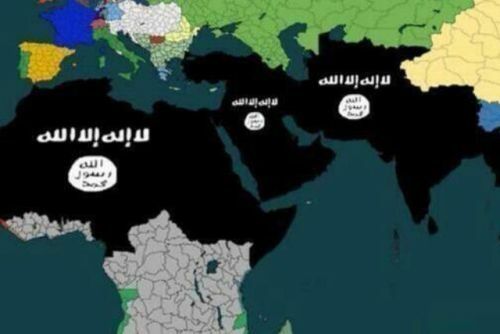 The above map is being circulated by ISIL fans on Twitter, and shows the organization’s dreams of overtaking much of central Asia. The black background with Arabic writing is the official logo for ISIL. The Star also reports that Malaysians have been undergoing extensive physical and weapons terrorist training sessions before arriving in the Middle East. The training camps typically feature a four month training session for recruits, similar to that of many military academies. The “endgame” according to the Star, is for the Malaysians to become suicide bombers against US, Western, or religious targets. “Some militants from Malaysia were reported to have received physical and weapons training by ISIL militants in order to join the insurgencies in Syria and Iraq,” Channel News Asia concludes. It is believed that much of the recruitment of Malaysians into ISIL is occurring through social media outlets.